Description: When the explorers Lewis and Clark asked the Shoshone woman Sacagawea and her husband, French trapper Toussaint Charbonneau, to act as interpreters for their expedition, the couple brought along their two-month-old son, Jean Baptiste. Over the course of the two-year journey, baby Baptiste won the hearts of the rough men of the corps. Captain Clark called him "my little dancing boy." But the rest of the story of this intriguing young figure has been largely untold--until now. 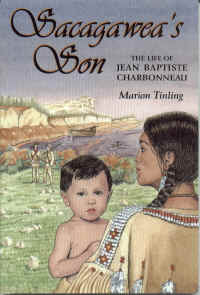 Sacagawea's Son: The Life of Jean Baptiste Charbonneau tells the action-packed, sometimes poignant story of a boy born to adventure. Baptiste's experiences with the Corps of Discovery were only the beginning. Educated in St. Louis by Captain Clark, he went on to live in a royal palace in Europe and to speak many languages. But, truly his parents' son, he returned to the American West, living out his life as a trapper, scout, and explorer alongside the likes of Kit Carson, James Bridger, and John Fremont. Readers ages ten and up will thrill to this lively and fascinating account of the life of Jean Baptiste Charbonneau--a child chosen by history.